at NASA's Jet Propulsion Laboratory! The Jet Propulsion Laboratory (JPL) is a NASA Federally Funded Research and Development Center focused on space exploration. Innovative technology created and/or used by JPL has taken humanity far beyond regions of space where we can actually travel ourselves. In order to enable such challenging flight missions, JPL utilizes state-of-the-art propulsion systems. Activities in advanced deep space propulsion are essential at JPL in order to expedite the adoption of new propulsion technologies and have full confidence the flight systems will meet all mission requirements. The Electric Propulsion (EP) Group at JPL performs two principal functions: First, it provides technological expertise for robotic spacecraft mission planners, implementers, and operators in support of current and near term flight projects. This expertise is geared toward A) increasing the reliability and life of EP systems as well as, B) reducing cost and mission time for spacecraft that would otherwise use conventional chemical propulsion systems. Specific examples of recent project support include the Ion Propulsion System (IPS) on the Dawn spacecraft and the first ever flight of colloid thruster on the Lisa Pathfinder (ST7) spacecraft. The second function of the Electric Propulsion Group is to identify and evaluate, through experiment and simulation, the feasibility of advanced propulsion concepts that may lead to significant advances in space transportation capability. Such new propulsion systems will be necessary to enable fast robotic exploration of the solar system (including sample return missions, outer planet orbiters and landers) and of the local interstellar neighborhood. Trailblazing has been the business of JPL since it was established by the California Institute of Technology in the 1930s. Pushing the outer edge of exploration, in fact, is the reason JPL exists as a NASA laboratory. JPL’s Electric Propulsion Group is proud to be a part in this on-going exploration of the frontiers of space. March 9, 2016 (press release)– The National Aeronautic Association (NAA) announced at their Spring Awards Dinner that the NASA/JPL Dawn Program Team has been named as the recipient of the 2015 Robert J. Collier Trophy “In recognition of the extraordinary achievements of orbiting and exploring protoplanet Vesta and dwarf planet Ceres, and advancing the nation’s technological capabilities in pioneering new frontiers in space travel.” The Collier Trophy is awarded annually "...for the greatest achievement in aeronautics or astronautics in America, with respect to improving the performance, efficiency, and safety of air or space vehicles, the value of which has been thoroughly demonstrated by actual use during the preceding year." The list of Collier recipients represents a timeline of air and space achievements, marking major events in the history of flight. Previous Collier recipients from JPL include Mars Science Laboratory (2012), Voyager (1980), and Surveyor (1967). As of Jan 10, 2016, all eight Colloid Micronewton Thrusters (CMT) on the LISA Pathfinder spacecraft passed their functional tests, becoming the first operation of electrospray thrusters in space. The CMT's were developed by Busek with technical support from JPL. The AIAA Electric Propulsion Technical Committee has recognized Ioannis Mikellides, Ira Katz, Richard Hofer, and Dan Goebel with the 2014 AIAA Electric Propulsion Outstanding Technical Achievement Award, "For the identification, development and demonstration of magnetic shielding in Hall thrusters." 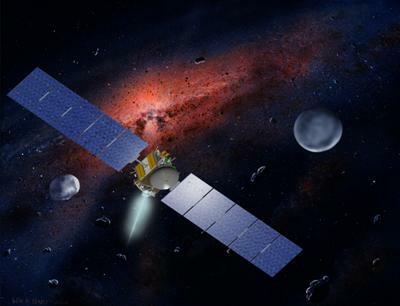 The Dawn spacecraft will enter orbit around Ceres using its Ion Propulsion System (IPS) on March 6, 2015. Dr. Dan Goebel has been elected to the National Academy of Engineering, the highest professional distinction for engineers. Goebel is being honored for his contributions to low-temperature plasma sources for thin-film manufacturing, plasma materials interactions and electric propulsion. The 20th Advanced Space Propulsion Workshop will be held at the Ohio Aerospace Institute near the NASA John H. Glenn Research Center, on November 17-20, 2014. ASPW is organized by JPL, NASA Glenn Research Center, and the Ohio Aerospace Institute. The AIAA Electric Propulsion Technical Committee has recognized the paper, "Conducting Wall Hall Thrusters," by D.M. Goebel, R. Hofer, I.G. Mikellides, I. Katz, J. Polk, and B. Dotson as the Best Paper in Electric Propulsion from the 2013 AIAA Joint Propulsion Conference. The JPL Electric Propulsion Group has won this award 9 out of 10 times since 2004. JPL researchers have shown how a new technology called magnetic shielding significantly increases the life of Hall thrusters while enabling operating voltages 100 percent higher than previously demonstrated. An online article describing this work is available here. The Asteroid Return Mission concept envisioned by our own Dr. John Brophy has been in the news quite a bit lately. A key technology enabling this mission is Magnetic Shielding in Hall thrusters, described below. The original study sponsored by the Keck Institute for Space Science can be found here.